What would an aircraft carrier look like when it's covered with an array of solar panels? The 2 megawatt solar array atop the DuPont Fabros Technology data center in New Jersey will give you an idea. What would an aircraft carrier look like when it's covered with an array of solar panels? 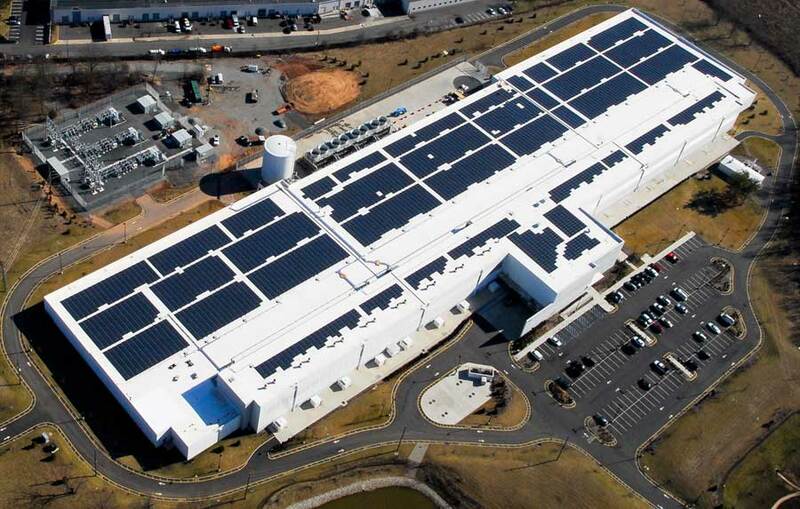 This photo of the DuPont Fabros Technology data center in New Jersey will give you an idea. The building is 1,100 feet long - about the length of a Nimitz class aircraft carrier - and will eventually provide more than 470,000 square feet of data center space to enterprises and Internet companies in the greater New York market. Solar arrays will likely never be able to fully support the power requirements of a major data center. The enormous photovoltaic array atop NJ1 is a 2.17 megawatt system. The data center beneath currently provides 18 megawatts of critical power for its data centers - and that's just the first phase, which takes up half the building. Once the second half comes online, that power capacity will double to 36 megawatts. Apple: The maker of the iPad and iPhone plans to build a 20-megawatt solar power facility to support the operations of its huge data center in Maiden, North Carolina. Apple also plans to use a fuel cell powered by biogas that could generate up to 5 megawatts of power. The Apple facility would be the largest solar array dedicated to data center operations. McGraw-Hill - The McGraw-Hill Companies will build a 50-acre solar array to support its data center in East Windsor, New Jersey, the company said today. The $60 million project will add 14.1 megawatts of solar generation, making it one of the largest initiatives yet to use photovoltaic solar power to offset the energy used by a data center. Sonoma Data Center - The developers of Sonoma Mountain Village will dedicate more than 1 megawatt of solar power to a data center project at its Rohnert Park, Calif. campus, a sustainable mixed-use community combining offices, retail and housing. The first phase of the data center will be powered by an existing 83,000 square foot solar array, which has been online since 2006 and currently powers office buildings housing AT&T and Comcast. eBay - E-commerce giant eBay recently unveiled its largest solar installation to date today, situated atop its “Topaz” data center located in South Jordan, Utah. The installation includes a 665 kilowatt (kW) solar power system, designed and installed by SPG Solar, featuring 72,000 square feet of solar panels, covering nearly the entire roof of the data center. This solar installation will produce 924,013 kilowatt hours (kWh) of clean electricity annually. Cisco - Solar cells on the roof of Cisco's data center in Allen, Texas generate 100 kilowatts of power for the office spaces in the building. Emerson Network Power - Perched atop Emerson’s new data center is a 100-kilowatt solar panel array, which is visible across the company’s corporate campus in St. Louis. Built in 2009, Emerson took a forward-looking approach for its $50 million facility, and sought to craft a design that could demonstrate the potential for solar in the data center. AISO - Affordable Internet Services Online (AISO.net), founded in 1997 and located in Romoland, California, is known for its environmentally-friendly web hosting, with clients including The Discovery Channel and Jean-Michel Cousteau’s Ocean Futures Society. AISO.net runs entirely on solar energy from its own on-site solar array. The trend for larger solar adoption comes as the industry's commitment to renewable energy has come under fire from the environmental group Greenpeace, which will be among the keynote presenters later today at the annual Uptime Symposium in Santa Clara, Calif. There's been an active debate among data center thought leaders the value of these huge solar installations. But what's clear is that the data center industry has come a long way in its implementation of on-site renewable energy. For more on the issue, see our special report on data centers and renewable energy.